I have maintained since its release that Far Cry 3 is one of the best video games of all time. Far Cry 4 was a worthy sequel, building upon everything that made the previous game great. So needless to say for the past three years or so, I’ve been anxiously anticipating the fifth installment of the franchise. 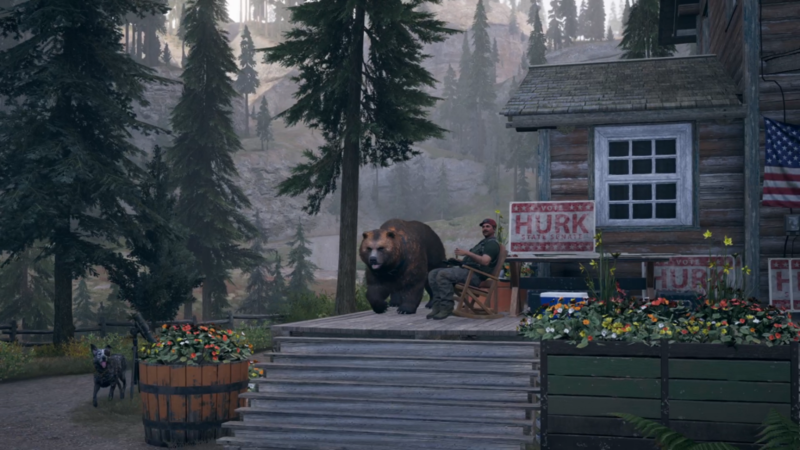 And I am happy to report that Far Cry 5 has exceeded even the highest of my expectations. Watch out, Vass. There is a new villain in town, and his name is Joseph Seed. 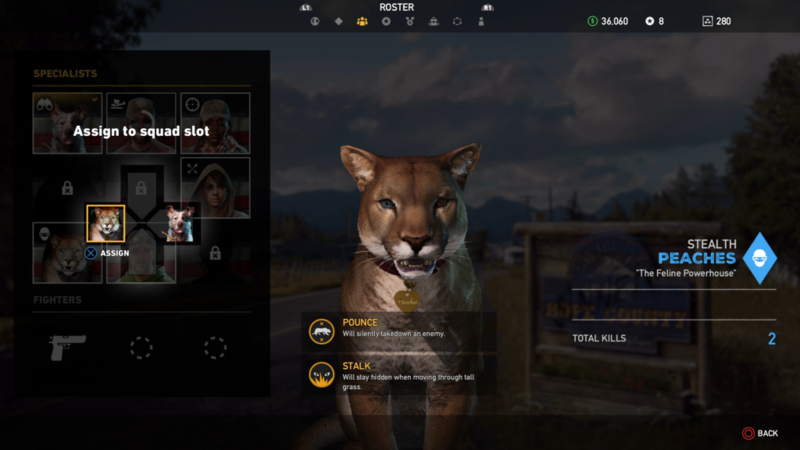 You are a rookie in the Hope County Sheriff’s Department, accompanying a U.S. Marshall with your team to apprehend the leader of the Project at Eden’s Gate – Joseph Seed. Referred to as “The Father,” Seed and his cult have taken over the area and created their own sovereign religious state. After serving your federal warrant, Seed willingly surrenders and allows you to take him back to your helicopter. But it isn’t long before his zealots – referred to as PEGies – attack the chopper, leaving you stranded in the middle of Hope County. As soon as you start a new game, you’re asked to choose whether you want to play as a male or female. Although the choice is final, it does not seem to have much bearing (if any) on the story. Characters refer to you as “Rook,” and “Deputy,” and never refer to you by name or with gender pronouns. So aside from personal preference, it really doesn’t matter what you pick. I decided to go with the female officer, who I was able to customize after the opening scene. Facial features and skin color are permanent, but ongoing choices are: outfits (or mix and match tops and bottoms), hair, head accessories, and handwear. Games in the Far Cry series have long been among the best looking games of their generation. The third game is where I found things started to get really photorealistic, and each game has looked better than the last. Far Cry 5 is absolutely gorgeous in 4K resolution, and without a doubt the most beautiful game in the franchise. I played the game on a PS4 Pro, with a 4K UHD Samsung display, and the visuals were stunning. I even tested out the supersampling option on a 1080p display, and the result was fantastic. The game take full advantage of the latest PlayStation’s 4K graphics capabilities – even rivaling much more expensive gaming PCs (I have a Geforce GTX 1080 and a 7th Gen i7, so I speak from experience). Far Cry is of course known for its large open world maps. For the first time in the series we are stateside, dropped in the middle of rural Montana. Like the tropical beaches, luscious jungles, and snowy mountaintops we’ve experienced before, the beauty of this farmland is wonderfully captured in this installment. 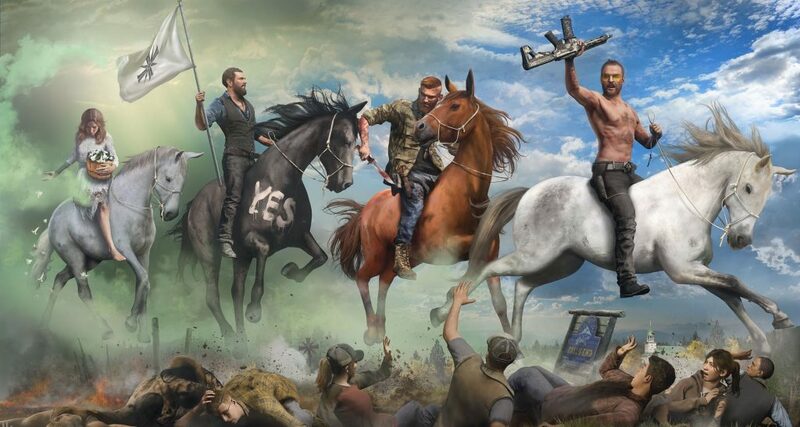 Hope County is comprised of three huge areas, each full of lakes, fields, mountains, and several small towns and facilities. When you’re being attacked by boats with mounted machine guns, cruising on the water and admiring the scenery is quite relaxing. I probably spent way more time than necessary completing the game, just to take in all of the impressive visuals. Far Cry 5 truly is eye candy. I love good graphics as much as the next guy, but the best looking game still isn’t much without a solid story to back it up. That’s what really hooked me and with Far Cry 3, playing as a relatable character who is stranded in the worst part of the jungle – and being forced to do whatever it takes to survive. 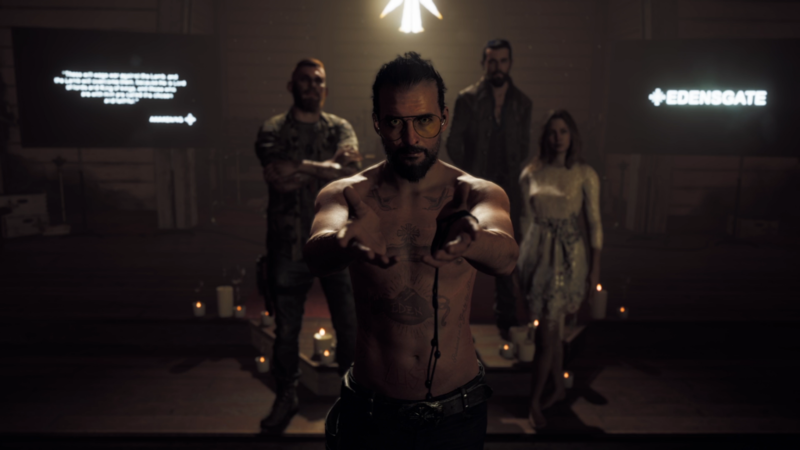 The fourth game does something very similar, and Far Cry 5 continues with this successful formula. You are a rookie deputy, learning the ropes while stuck in an awful situation. The story is fascinating because you are dealing with a group of people who believe they are saving lives and doing the right thing. These are just a bunch of mustache-twirling maniacal villains. Even while you surely don’t agree with their beliefs, or their methods, there is an understanding of their actions. This complex writing behind each of the characters is what adds a lot of depth to the game, and stops to make you think before pulling the trigger at times (and sometimes quite literally). Joseph Seed is voiced and motion-captured by the talented Greg Bryk. One of the things that makes this character so menacing is how calm and collected he appears. “The Father,” as he is called, is often soft-spoken and well articulated. The player is frozen by his intense gaze, much like a pronghorn in the headlights. He doesn’t have to yell or muscle you around in order to be intimidating. His creepy prayers and drawn out religious ramblings are enough to send shivers down your spine. Bryk’s performance is fantastic, and my favorite since Vaas in the third game (who was incredible). Each of the three territories in the game is run by one of the Seed siblings. John “The Baptist” runs Holland Valley, preaching “The Power of Yes.” He even has spelled out in huge letters on a hill, just like the Hollywood sign. One of his signature moves is tattooing your sin on your body, and absolving you of it by literally cutting it out. 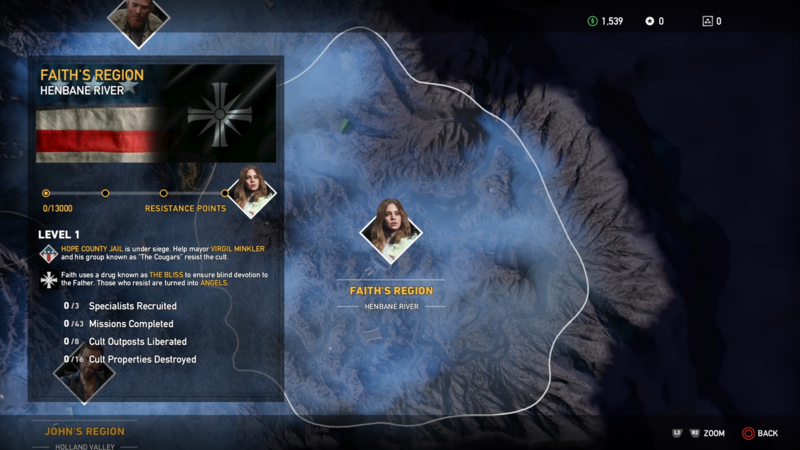 Faith “The Siren” is in charge of the Hebane River area. Her role in all of this is spreading Joseph’s word by drugging new followers with BLISS – a synthesized drug which causes people to hallucinate and be easily manipulated. Run-ins with her are quite trippy, complete with dreamy visuals and tranquil music. Finally, Jacob “The Soldier” is in charge of the Whitetail Mountains. He’s former Army, with a knack for training soldiers to become stone-cold killing machines. He combines the BLISS with intense training methods to turn recruits into super soldiers. He also does experiments on Wolves in order to control them. The goal is to complete enough missions in each area, through a combination of story missions and side quests, to become hunted by the leader. As you progress, each leader will find you and abduct you at certain points. You are forced to fight your way out of their traps, and overcome their methods. If you have played the previous Far Cry games, including Primal, you are already familiar with the mechanics of this one. Which is a great thing, because they are perfection in my opinion. They don’t need to reinvent the wheel in order to make these games enjoyable. But what they do is build upon each one, keeping what works and ditching what doesn’t. Missions aren’t going anywhere, that’s a given. But the progression system, which I found quite enjoyable, is brand new. Instead of being forced to complete all of the story missions in a linear fashion, you can play the game how you want to and reach the end your way. Completing missions, destroying structures, and disrupting Eden’s Gate all earn you RP – Resistance Points – which are used to fill the Resistance Meter. That’s what causes the leader of the area to call you out, leading to a showdown for the territory. I love the idea of completing the game in whatever way feels right to you, and making your own choices which change the outcome. One of the more tedious parts of open world games has been climbing towers to vantage points that unlock parts of the map. 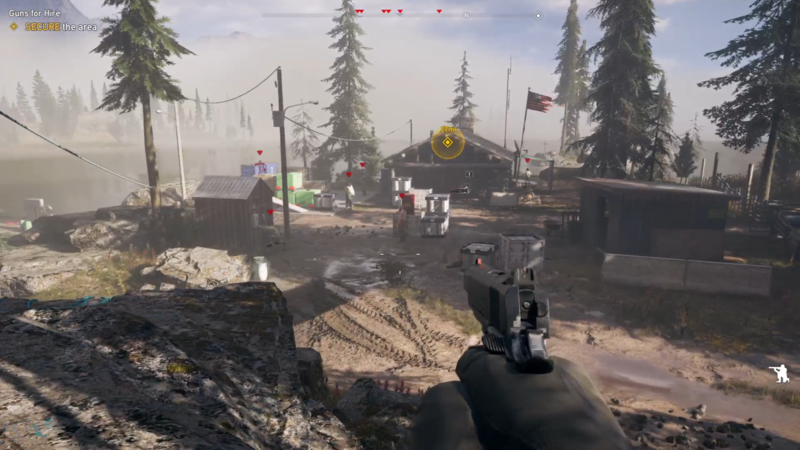 Far Cry 5 does away with the climbing puzzles, and goes the way of games like Tom Clancy’s Ghost Recon: Wildlands which reveal the map as you travel across it. This is a huge plus, allowing you to discover new regions by exploring instead of constantly falling to your death when you don’t perfectly grab a ledge. The hunting and crafting system is back, a staple of these games which doesn’t need to be touched. It’s simple, and streamlined, and works very easily by selecting the items you want to craft from the weapons wheel. No need to pause the game or go through menus, which is fantastic. The same goes for skill trees, unlocking more abilities as you complete challenges. Pretty simple, and fans of Far Cry, Assassin’s Creed, Watch Dogs, and many others will know what is going on here. Increase your health, better aim, more inventory slots, increased damage. You know the drill. 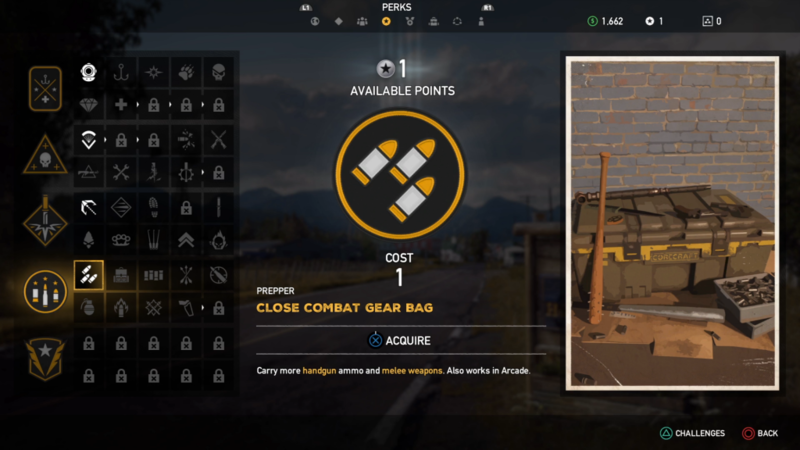 Far Cry 5 features the largest variety of customizable weapons and vehicles in the series. Modify your guns with a wide variety of scopes, silencers, and magazines. And deck out your ride with different skins, paint colors, and interior designs. My favorite new feature is the “For Hire System,” where you can enlist the help of the guns for hire that you meet along your journey. All of these specialists are interesting, well-written characters – some of them quite hilarious. But the absolute best part is that you are not only limited to humans. 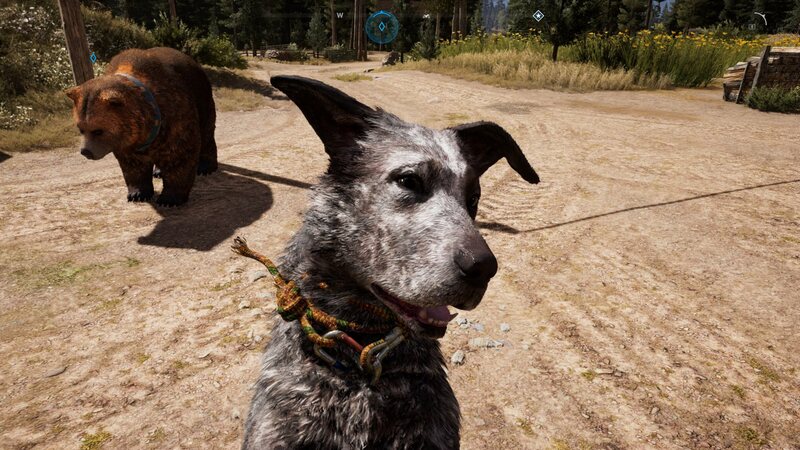 There are three animal companions available for hire: Boomer the dog, Peaches the cougar, and Cheeseburger the bear. Yes, a huge grizzly bear named Cheeseburger can be your friend. And he is adorable. Each of these characters has certain abilities which come in handy under different circumstances, and part of the fun is choosing who to call. And the animals don’t trade in functionality for cuteness – they attack enemies and revive you when you are down. I’d be lying if I said I didn’t always have an animal equipped for my missions. Watching your giant bear bowl over enemies, while your dog helps you track them, is so much fun. And did I mention that you can pet them all? I always try to keep my expectations in check when anticipating a new entry into a series I love. I’ll admit it was pretty hard to do with this one, but luckily it didn’t matter. 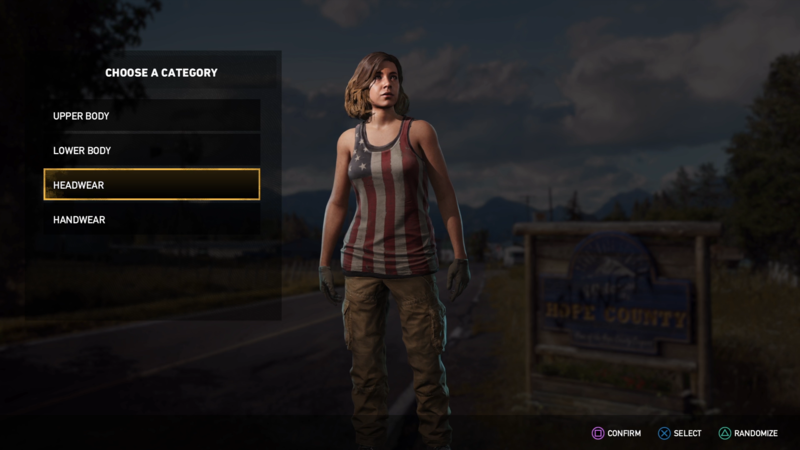 Far Cry 5 excels in all of the areas that I hoped for and adds a lot of new features to keep things exciting. The game takes all of the best parts of the third and fourth installments in the series, and marries them together into a fun-filled adrenaline rush. The story and world are intriguing, grabbing you with well-written characters and pulling you in with terrific performances. And at the end of the day, it is a videogame – which was a whole lot of fun to play (and hard to put the controller down). Even when you finish the story and all of the side missions there is a limitless amount of activities to check out at the new Far Cry Arcade. Play user created maps, with single-player, co-op, and 6v6 PVP modes. You can create your own maps using the arcade editor, featuring these game modes: Outpost (like in the story), Assault (waves), Bounty Hunt (kill marked targets), Journey (start to finish, similar to a race mode), Deathmatch (kill to score), and Team Deathmatch (team with the most kills wins). Plus, Ubisoft has included over 9,000 objects from Far Cry and their other properties, like Assassin’s Creed and Watch Dogs. Your imagination is the only limit here, and make–s for endless fun. Another plus is that the game is not a short one, even if you skip most of the side quests. I was sucked in by the story, and had a blast fighting through the Seed family tree and their armies. I’m excited to go back through and unlock everything, along with playing through all the content available with the season pass. We have three brand new adventures to look forward to: “Hours of Darkness” (Vietnam), “Dead Living Zombies” (B-movie zombie-killing fun), and “Lost on Mars” (self-explanatory alien shoot-em-up). Plus, believe it or not, you get to play Far Cry 3 (story-mode) free- and four weeks before it goes on sale separately. Ubisoft has done it again, and Far Cry remains one of my favorite gaming franchises of all time.